All my life I’ve heard about The Great Depression that occurred in the United States after the 1929 crash of Wall Street. The part I didn’t remember was the domino effect that occurred as a result. Apparently the American government was in such a panic about the depression that it called in loans to other countries and put up customs barriers to stop imports of foreign goods. This created an economic downturn across the globe. 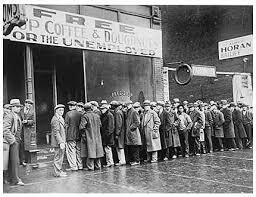 In Britain, unemployment skyrocketed to nearly 25% with over two and a half million people out of work. The industrial areas in the north of England, Northern Ireland, Scotland and Wales were most heavily impacted. 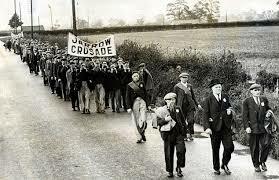 In 1936 the residents of Jarrow marched on London to protest what was happening. The men carried a petition to the House of Commons, but the issue was never debated. The workers trudged home believing themselves to be failures. On the other side of England families were becoming affluent. In the southeast portion of the country, new light industries such as chemicals, electrical goods and automobiles were thriving. The people who still had jobs benefited because prices fell and their money went further. Local councils built 500,000 council houses which further served to pour money into the economy. Just like the United States, Britain tried a variety of programs to help the country recover from the depression. 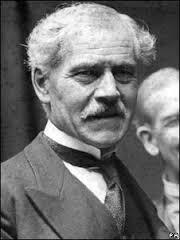 However, also like the U.S., Britain's problems with unemployment and economic depression were solved with the advent of WWII which got industries back on their feet and booming.